I've finally put a name to my condition. And what exactly is Design ADD, you might ask? Well let me tell you a little bit about it...because if you are reading my blog, you may just suffer from it as well. 1. Do you enjoy a cottage style room as much as a contemporary space? 2. Do you enjoy reading Country Living and House Beautiful or Elle Decor equally well? 3. Do you love the thrill of the hunt regardless of whether you're thrifting, junking, shopping online or going to a design showroom? 4. One day do you want an all white room while the next day finds you in love with color, color and more color? 5. Could you redesign your spaces often? 6. Are you constantly tweaking your rooms? If you've answered yes to 1 or more of these questions, you too may suffer from Design ADD. My style is constantly evolving. A fact that is true for most people, I'm sure. But as I have perused my favorite decor magazines, books and blogs lately, I've found that I really love some very disparate styles. 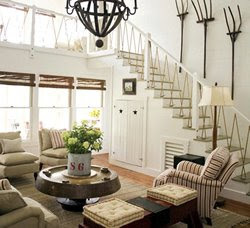 My house tends more toward a cottage look, although I've lately been incorporating some more contemporary elements. I like to call it Urban Farmhouse, but maybe Contemporary Cottage might be a better fit. All I know is, I love Interior Design. It fascinates me. And if I have to live with Design ADD as a result, then I guess I will. How about you? Do you have Design ADD? Frugal Friday goes up tonight at Midnight. Can't wait to see what y'all have up your sleeve this week! Yes! I'm just so glad there is a name for it. I answered yes to everyone! That's so funny because the past week or so I've been trying to put a name to my decorating and came up with urban cottage! I answered yes to every question. It feels good to know I'm not alone. Can we consider this our support group? Um...what if I answered "yes" to every question! :) Guess that makes me crazy for design! LOL!! I really do like so many styles, and have found that I also combine design elements from different styles. It's just more fun that way! Yup, I have it too. My number one issue is the colour thing ... one day I want everything white, the next I want to change everything to colour. Unfortunately, this means I tend to keep everything bland and neutral, but I'm trying! Is there a support group for this condition? Very funny. I sometimes get asked if I "do other styles"...from people who are considering hiring me. 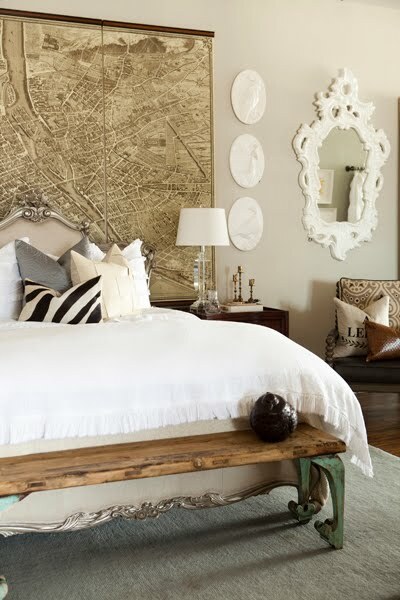 My answer is something along the lines that I like all styles of decor...when done right. I think that is the key, good design can be found anywhere in any style, drawing us in! YES! That's why my house is so confused. Thanks for the pics, Wendy-- I'm ready to tackle a seriously huge guest bedroom project and need inspiration! definitely Design ADD with a side of inability to decide! Oh the pictures... design ADD yes, but the pictures!@!?#! My lands, the pictures are certainly not helping my design ADD or my budget. Like any new disease, I am happy to hear it has a name - I have suffered from it "forever"...I have always said that I wish I lived in a 30 room house so I could just decorate each room differently - but when I realized I would have to clean them all my senses got the best of me and I bought a sensible sized home! And seriously...I'm addicted to design/decor magazines. I love them all! Too funny! Glad to hear I'm not the only one. Wendy, this cracks me up! And it's just want I need~ a name for my "condition"! The next time my husband asks me why I'm redecorating a room for the 200th time, I will just tell him it's because of the Design ADD! :) Oh well, if we have to have a sickness...I guess it's a good one to have! Good name for it. I love to read the decorating/constantly redecorating blogs, but I wonder do they ever find contentment and enjoy things as they are for awhile? Their poor husbands and families! I have a severe case...and I really NEED that bench with the aqua metal legs at the foot of MY bed!! I most definetly have it!!! But I have begun to say no to all those other designs that I admire and stick to what I know I will never ever tire of...a coastal white cottage...for I dearly love the sea and that is not ever going to change. I said to my husband, "I really love the direction the decorating is going this time. It's the best makeover yet." He kissed my forehead and said, "You've said that EVERY time." He's lived with my Design ADD for 20 years. I thought I was just indecisive. Thank goodness it's an "illness" and not just an annoying personality trait. YES.I.DO....it is a terrible affliction....makes my hubby crazy (but secretly he love it too)...When people come to our home and compliment the furnishings, curtains, etc...my hubby always claims "we are renting it (them)"...he is soooo funny. Hubby always jokes that when he goes out of town, he can never come home after dark because he will bump into rearranged furniture! And my husband has the other ADD. Wanna come over and see what a day is like here in our house????? LOL! You just described me! I hate it! I wish I was just one style then maybe it would make decisions easier! Since it has a name, can we qualify for disability now? or have a support group? I feel exactly the same way. :) Thanks for sharing. I was feeling like my design style was fickle. Now I know it's an actual condition. Whew. Oh my!! IS that what I suffer from?! One day I love a blog that's dedicated to WHITE and the next I fall equally in love with one celebrating color!! My family is moving into a new home next week...next week I say...color or white, color or white? The clock is ticking but I know the most important thing is that it feels like HOME!! Great post! Thank you! I also have the color issue - one day I want my house all done in whites and creams and the next I MUST have color! My poor husband!